A 24-annulene. Click on image for model. It was a highly unexpected outcome of a nickel-catalyzed reaction and was described as a 24-annulene with an unusual 3D shape. Little attention has been paid to this molecule since its original report, but the focus has now returned! The reason is that a 24- annulene belongs formally to a class of molecule with 4n (n=6) π-electrons, and which makes it antiaromatic according to the (extended) Hückel rule. This is a select class of molecule, of which the first two members are cyclobutadiene and cyclo-octatetraene. The first of these is exceptionally reactive and unstable and is the archetypal anti-aromatic molecule. 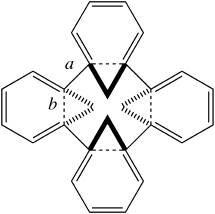 The second is not actually unstable, but it is reactive and but conventional wisdom has it that it avoids the antiaromaticity by adopting a highly non-planar tub shape and hence adopts reactive non-aromaticity. Both these examples have localized double bonds, a great contrast with the molecule which sandwiches them, cyclo-hexatriene (i.e. benzene). The reason for the resurgent interest is that a number of crystalline, apparently stable, antiaromatic molecules have recently been discovered, and ostensibly, molecule 1 belongs to this select class! …..